In the weeks following Anna and Abby going to Heaven hundreds of cards and letters flooded our mailbox. I remember sitting with them, unopened, wondering how I was ever going to get through them all. I would sit each night opening just a few, because that was all my heart could bare. We were the family receiving the dreaded sympathy card. I remember sitting amongst them in total disbelief that we were on the receiving end and these written words were intended for us. “I’m so sorry for your loss.” People shared their memories, thoughts and condolences. These cards were from friends, family, old classmates, parents, children and complete strangers – all wanting to take just an ounce of our pain away. I remember feeling so loved and cared for as I read each one, still in complete shock of my reality. One letter that we received has come to my thoughts many times over the past 4 years. I remember standing in the kitchen the first time I read it and remember exactly how it made my heart feel. The sender, someone that we did not know, shared of her own loss. Two children, first her son (9) then her daugther (16), many years ago. It was the next line in the letter that I remember most. I remember my heart sinking ~ 45 years. I remember thinking that there was no way I could survive all those years without my girls. No way! She included a poem that was given to her by her son’s teacher and also her phone number in case I needed someone to talk to. I never called but have thought of her many times as each day without passes. Today, while chatting with a girlfriend at the grocery store, a woman approached us and asked if she could give me a hug. She said that I didn’t know her but she knew who I was. She told me that after my girls went to Heaven she sent me a letter with a poem. Immediately I knew it was her, still surviving. She told me she included her phone number because she had no one to talk to when her children went to Heaven. She wanted to make sure that I knew I wasn’t alone. Her number was a lifeline for me if I needed it. Immediately my heart was full of gratitude and connection. I needed her lifeline today. Tonight I found her letter and there it was, the poem and the number that I know I will call soon. And mourn for when she’s dead. You’ll have her lovely memories as solace for your grief. We had just had the conversation, one that kept coming up over and over again. We needed to save some money so that we could do the work necessary to sell our house. We talked about the 5 year plan and how, if we really focused our efforts, we would be in “our house” in no time. When Tom and I blended families we made the decision for all of us to move into his house and rent out my townhouse. 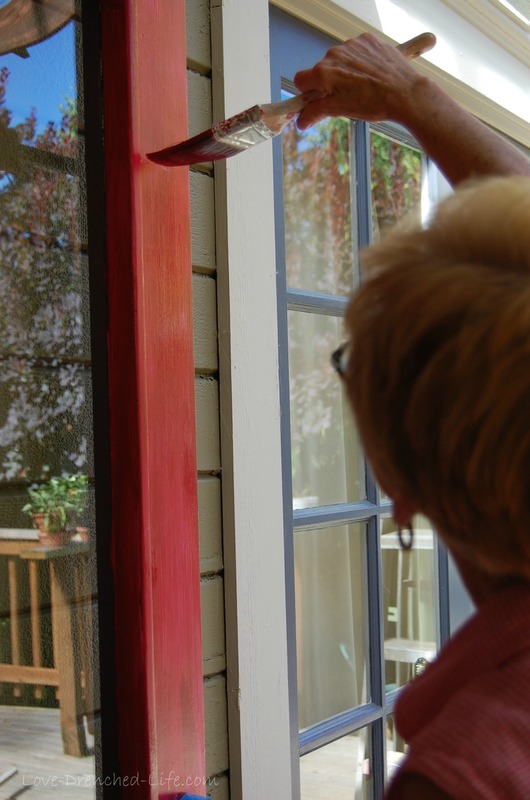 This decision was made because of space and because of where we wanted to live long term, Forest Grove. We knew from the beginning, when the market was better, we would eventually sell both places and find the perfect home that we both, with the help of the children, picked out. I remember daydreaming about the girls running from room to room in a big empty house trying to figure out which rooms would be theirs. I was excited about creating a space that was ours from the beginning and about the possibilities of a bigger yard so we could have chickens, something I’ve wanted since I was a kid. I was never coming back, how could I. It was empty and I knew that I would feel that in the core of my being, and it would be too painful. It was during the first week after they went to Heaven; Tom and I were staying in a hotel and couldn’t sleep. Holding hands we talked about what we were going to do. He asked if I wanted to go see Sampson, I did. So in the middle of the night we got in the car and drove home. Sampson was so happy to see us. He was old and missing his people. I immediately went down to the studio and started writing a letter to Anna and Abigail to put at the memorial. The site was already filled with balloons, flowers, stuffed animals and lots and lots of cards from so many people grieving the loss of my girls. The tree was empty, it was my canvas, and I quickly began the process of filling it with the letter and two photos. I stood in the exact spots, this is where they met Jesus. I went back into the house and I met Tom in the living room; we stood silently, both feeling the spirit of our girls. As I’m typing this I feel them, looking over my shoulder wondering what words I will choose next. When I’m in their rooms I can hear their laughter, feel them dancing around me and sometimes when I close my eyes I can see their smiles, their eyes and the beautiful way they both moved in this world. That night we decided there was no place else we would rather be. My mom has been here all week helping us to repaint our living space. Once dark, red, green and even black in spots, is now white and yellow with red accents. We had slowly been working on it but my mom is a rock star painter and has gotten the job done. In the mornings she sits in Anna room and reads. I know she feels her granddaughter too. We are so grateful to everyone in our life who has helped us in some way these past 9 months. 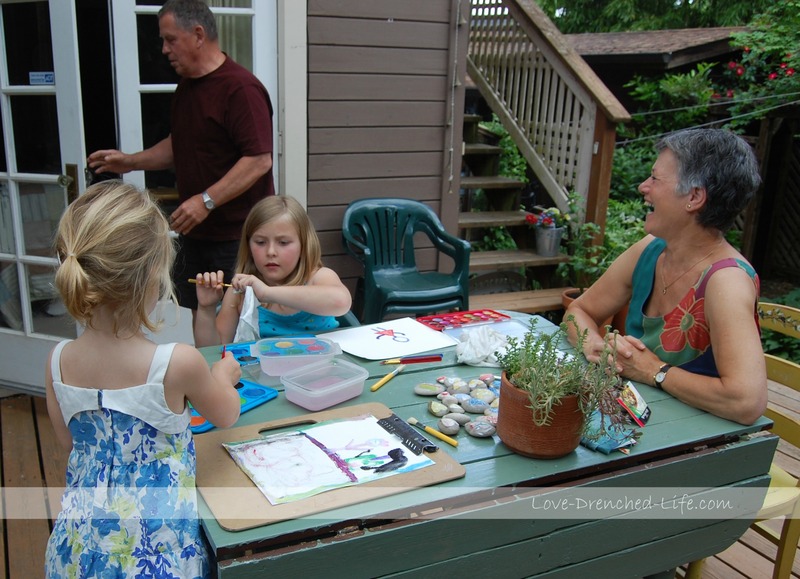 Our house transformation, the painting, the deck and all the work that has been done, has allowed us to focus on each other, our girls and on sharing love and joy. This big old house of ours, the one we were so ready to get out of, has become more than just a home. It is the place we have experienced a love drenched life with our family; a space in which we celebrate the life of our girls and it’s our safe place where we can be when our hearts are heavy. We are no longer on a 5 year plan. This old house is “our house” and we aren’t going anywhere. A couple of months ago our friend Rebecca, from the Pacific Northwest Transplant Bank, asked us if we would come and share our story with medical staff from local and regional hospitals and transplant and procurement teams. Of course our answer was yes – so we wrote it on our calendar and slowly started to prepare ourselves for today; the day we would come face to face with the people who found homes for Abigail’s organs and tissue. I was nervous and on edge, especially after my morning trigger. Being able to share our story, one we wish we didn’t have, with these people meant the world to us. Looking out and seeing the faces of those who diligently worked on finding recipients for Abigail’s organs comforted me while I shared about our families last weekend together. I could see how much they cared about us, a donor family, and about our girls. We shook the hand of the surgeon who performed Abigail’s surgery and we were able to thank him for his work. In his care our Abigail gave the greatest gift. Today this was my rainbow. The trigger is gone and I am overwhelmed with gratitude for the men and women who dedicate their lives to helping donor families heal by working hard to place their loved ones organs, so those who are sick can live. We did not have a choice on whether our girls were going to Heaven. We did have a choice on whether Abigail would leave a legacy of hope, I’m glad we made the decision we did. I know both of my girls are smiling! Almost once a week I get a card in the mail from my friend Barb. Our connection here in Oregon goes back to my home town in Ohio where we both spent a large part of our lives. Her son is friends with my younger brother and, after we had both moved to Oregon, we met at my brother’s wedding. We were instant friends. She has been such a gift to me and her weekly cards bring a smile to my face. 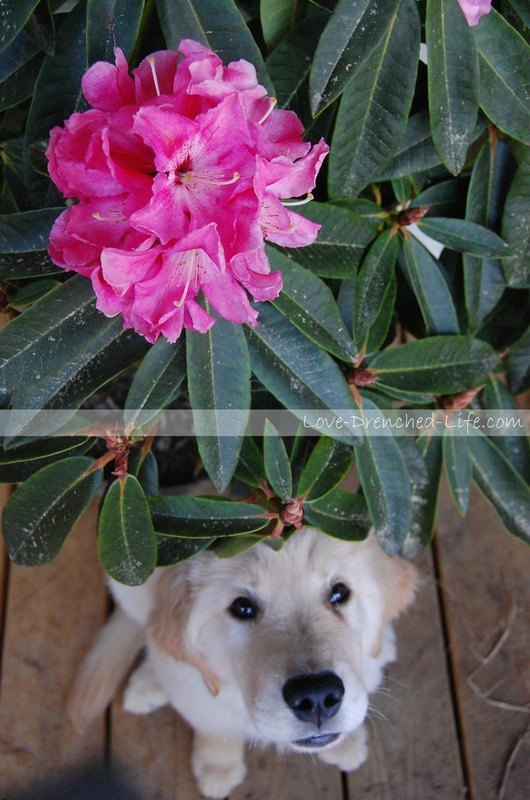 Yesterday morning she dropped off a bag of gifts, so I can pamper myself, a beautiful card and an Anna Rhododendron. She didn’t knock but rather just left them on my porch. She doesn’t live close and I know my house was not on her way to work. This gesture meant the world to me, even though I wish she would have knocked so I could have given her a hug. I sent her an email thanking her for what she had done and to wish her a Happy Mother’s Day and this is what she wrote back. As I read this I realized that is exactly how I felt – one more day with my own private cheering section, one more day closer to when we are together again. I have a vision of God sitting watching me, nudging my thoughts and tugging on my heart. He sits there with two young girls by his side. He knows me but he allows my girls to tell him about their mom and what she likes, doesn’t like, what makes her happy and what makes her grumpy. I feel these nudges: Love Rocks, celebrating rather than isolating, decorating a tree and making it a happy place and sharing with people the glory and power of God. I listen because I am at his mercy. He has shown me that He and Heaven are so real and that our lives are to be lived in honor of Him. In believing in Christ, I have a peace that surpasses all understanding and I know that my life here is just a dot on a continuous line. I miss my girls so much and I cannot wait to be with them again in the presence of God. I know that one day I will hug them and it will never have to end! In the meantime, I will listen and I will follow those nudges. I know they won’t always be easy to follow but I know that God is in control and my girls are cheering me on. Thank you Barb for your beautiful gifts and for your email! I woke up yesterday with a tremendous about of peace, knowing that a lot of people were keeping me close in prayer. That power that we have when lifting someone up to God is amazing. I will never doubt that prayer can move mountains, because prayers have truly kept me afloat through some of my darkest hours without my girls. I can’t thank enough those who pray, but I can pray for them and I do – fiercely! 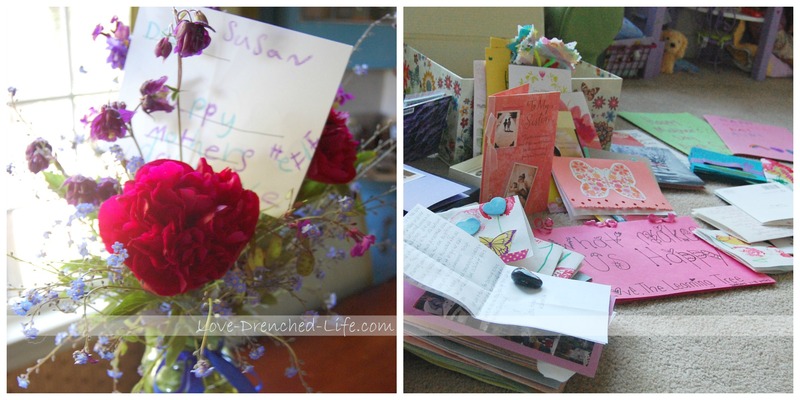 Yesterday I received a lot of flowers, cards, chocolate and goodies. I was, and still am, overwhelmed by the love that people covered me with on a day that should have been spent celebrating with my girls. Your love and kindness is so appreciated. Thank you so much and know that you are in my prayers and I have two little girls that whisper to God on a regular basis…you will be covered by His love, I promise. It’s amazing what this four letter word can do to ones heart. Thank you for responding to Love Rocks and choosing to love fiercely those around you. I can’t wait to see how the love of two little girls and our amazing community ripples across the country. Thank you to all of those who sent us cards, put flowers in our front yard, made homemade eclairs, made a cake or said prayers for us this past weekend. We are so blessed and feel so loved by so many. We have found that in having no expectations for what each holiday will bring, we are always amazed at the peace and love we feel as we move through our year of first. We know, without a doubt, that our girls were celebrating Easter and Tom’s birthday in the most glorious place of all. We smile at the thought of the perfect milkshakes they were drinking to honor their dad/Tom as we were eating store bought ice cream. These next couple of weeks are going to be very busy for both of us. Right now we are in tech week for Guys and Dolls which opens this coming weekend. Once again we have spent the last 2 months with a group of amazing people laughing, creating and celebrating community theater. We feel so blessed to be a part of Theater in the Grove and have truly found that it is a place we not only feel the presence of our girls, but also are surrounded by people we truly love and love us. 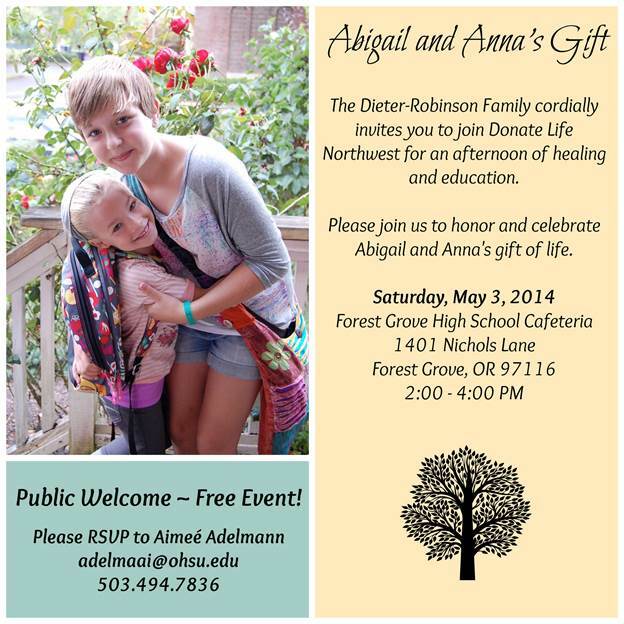 We are also very excited to be hosting an event on May 3rd, alongside Donate Life Northwest, to celebrate the gifts that our girls have given during their lives. We feel very blessed to be part of the Donate Life family and are honored to share Abigail’s donation story. We are so proud of the fact that she has impacted so many lives through her donation. Anna has also given an amazing amount of gifts to those around her during her short life on earth and continues to do so now that she is in Heaven. I am looking forward to sharing with our community all of those gifts and to celebrate and bring awareness to organ donation. If you would like to attend you can register at http://www.donatelifenw.org/content/events. Needless to say our plates are very full right now. Sometimes being busy is a blessing and sometimes it’s not. I have found that I have become quite the introvert and I find that a good day for me is one in which I can lock myself in my house and spend hours on iPhoto or in heaps of fabric in front of my sewing machine. My life is busy right now honoring my girls and celebrating their lives; this brings me joy. I have found that even through this joy, moment by moment there are a variety of emotions. My heart hurts in places I didn’t know could hurt and it has also felt joy in ways I could never imagine, especially given our circumstances. My heart will never be whole again here on earth, pieces of it now reside in Heaven with my girls. I do however feel that with suffering emotional pain one can truly feel the joy in new and different ways they never thought they could. My girls have always brought me joy…now that joy is supernatural and a gift from God! I love and miss them so much. One thing that I have found more than anything else these past six months is that my girls knew how to really love in their very short life here on earth. 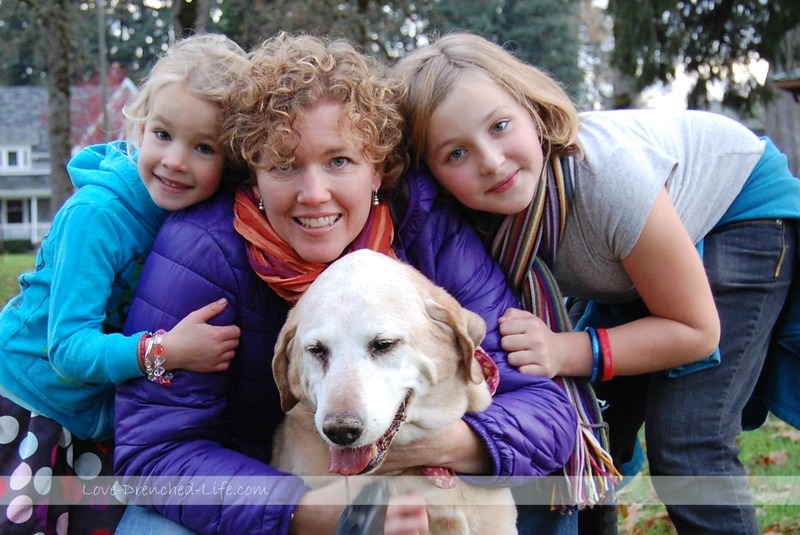 People have shared with us story after story of how my girls have impacted their lives. I think they will continue to do so even now that they are in Heaven. I feel so blessed that I got to feel that love daily. I am so blessed to be Anna’s and Abigail’s mom. 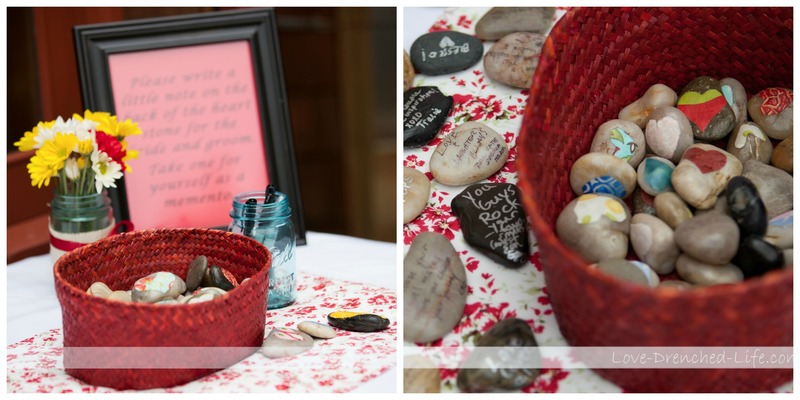 When Tom and I got married the girls and Tom’s mom made heart rocks for people to write a little message on at our wedding. Those rocks are found all over our house and remind us of all the love we had and continue to have surrounding us. When we came back to our house after the girls went to Heaven, those rocks had a whole new meaning – – so simple yet so powerful. We also had everyone take a Love Rock home with them to remember our special weekend. It’s nice to see these rocks when I visit their homes. 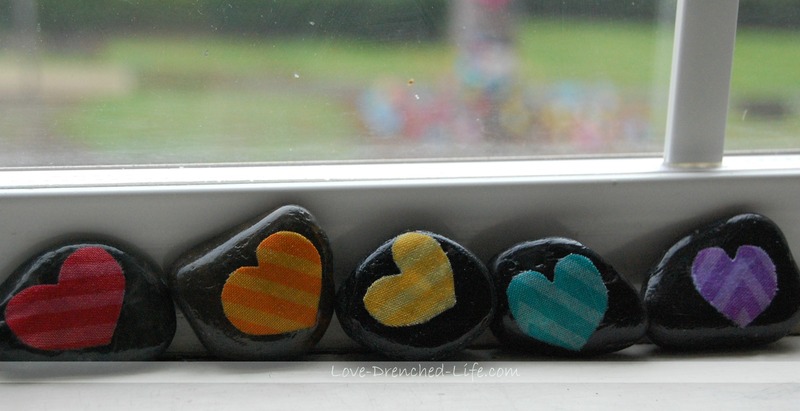 For Valentine’s Day this year I made Love Rocks for all the students in both Anna’s and Abigail’s classes. It made me smile to see the kids hold them tight in their hands as if they were holding Anna’s or Abigail’s hand tightly. Those smiles gave me an idea. Wouldn’t it be fun to leave Love Rocks all over for others to find? People know how Tom and I are hurting, but for most people their struggles and hurts are hidden. You never know exactly what people are dealing with on any given day. Giving and receiving love is very therapeutic and definitely good for the soul. To get involved, find or make a Love Rock and spread the joy. Give the rock to someone while doing an act of kindness for them, place the rock somewhere special for someone else to find or simply give the rock to someone and just let them know they are loved. You can write a little message on the back or just leave the heart to say it all. I keep a bag of Love Rocks in my purse, in my car and I have a few in my jacket pocket. I have found so much pleasure in leaving these rocks in places people will find them. We took some to Seattle with us, I’ve left some on a long hike we did a couple of weekends ago and while getting my car fixed, I just left one on the counter at the dealership. I smile at the thought of those who find them. What will they think? Will they feel the love? I sure hope so. So, if you feel moved to join me in spreading love, get out your Mod Podge and go to the dollar store and buy a big bag of rocks and some fabric. Here is a little DIY for those who need it. 1. Cut hearts 2. Mod Podge top of rock 3. 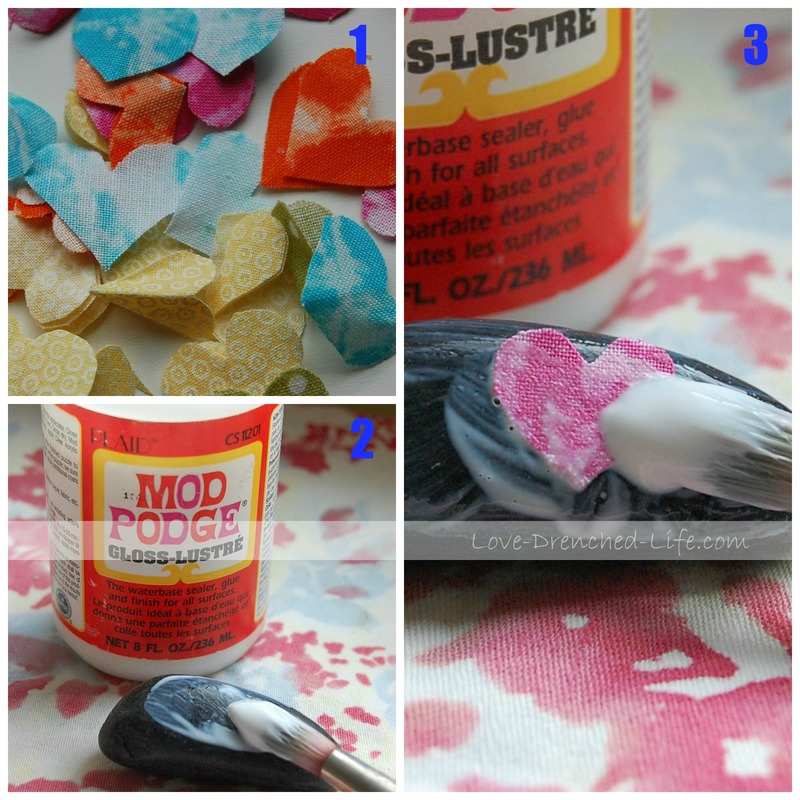 Place heart on wet Mod Podge and then apply another layer on top of the heart. Let dry and spread love! 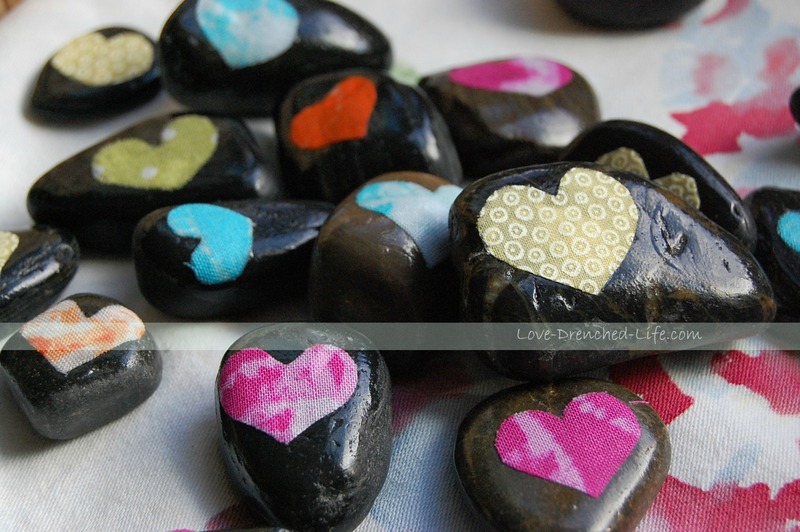 After giving or receiving a Love Rock, log onto http://www.facebook.com/lovedrenched and share your story or pictures of your creative placements. Leaving a rock at the dealership was a bit tricky — I felt like a spy when I was doing it which made me think of the many times Anna and her friends would try desperately to sneak downstairs and spy on me while I was making dinner. I smile at that thought. Anna and Abigail would be all over this. They would have hundreds of rocks made and would be leaving them all over the place. I smile to think that their love shines ever so bright. Once again, I’m proud to be their Mom! 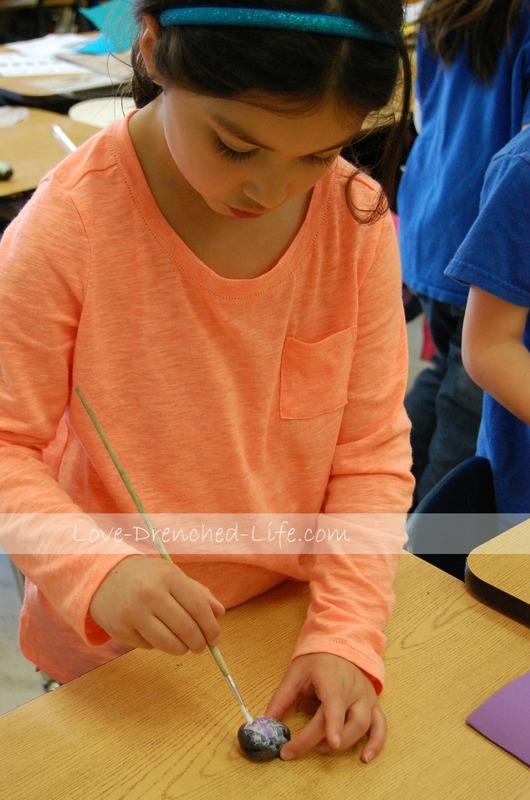 If you just don’t have the time to make your own Love Rocks visit Anna and Abigail’s tree. There is a basket of rocks already made just for you. Please take a few and spread the love. I promise it will come back ten fold.